In Partnership with Ventura County Behavioral Health. Available for Medi-Cal eligible children/youth. Services are family driven, in-home and/or in-office and provide counseling and case management and support services focusing on childhood attachment trauma. In partnership with Ventura County Children & Family Services. Available for Pre and Post Adoptive Families, Guardianship and Long-term Placement. An 18 session in- home service. Families participating in a therapeutic process. Attachment and trauma focused interventions based on a relational model of change. In partnership with Ventura County Children & Family Services. For newly licensed or re-licensed Foster Caregivers within Ventura County. Providing an individualized 6 hour training focused on therapeutic parenting techniques. 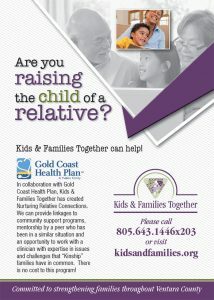 In collaboration with Gold Coast Health Plan, Kids & Families Together has created Nurturing Relative Connections. We can provide linkages to community support programs, mentorship by a peer who has been in a similar situation and an opportunity to work with a clinician with expertise in issues and challenges that “Kinship” families have in common. There is no cost to this program. In partnership with Ventura County Community College District and Ventura County Human Services Agency. Available to kinship caregivers within Ventura County that have come together through foster, kinship and adoption. This program connects new or existing kinship caregivers with experienced kinship caregivers providing clinical counseling, education and support services to help caregivers navigate the Child Welfare System and community resources. In partnership with Ventura County Children & Family Services. Available to Birth families from within the Child Welfare System. An 18-session in-home therapeutic support program. In partnership with Ventura College. Available to Foster and Kinship Caregivers within Ventura County Child Welfare. Providing weekly in-home services specializing in topics relevant to caregivers of children who have experienced attachment trauma. In partnership with Ventura County Children & Family Services. Birth Parents in the process of family reunification within the Child Welfare System. Social worker referral required. Completion of 26 therapeutic parent & child sessions (visits) focused on re-integrating family in preparation for reunification. Parent support groups and psycho-educational training on attachment, parenting styles and complex trauma.